This entry was posted on 8th May 2017 by Dynamic CCTV. Our new product price guide has just been released which is packed with a number of new products, Valid until the end of July. We now have in stock the Easy IP3.0 range of IP cameras. Some of the benefits of the Easy IP3.0 range are H265 compression, improved IR performance and Darkfighter technology on the 2MP models, the range is available in 2, 5 & 8MP (4K). These cameras are supplemented by a new range of low cost NVRs that support H265 recording at upto 8MP. High definition analogue is not being left behind and on the TVI front we now have in stock the Hikvision 5MP range of cameras & DVRs, as always with Hikvision products these offer top quality performance at a fantastic price point. 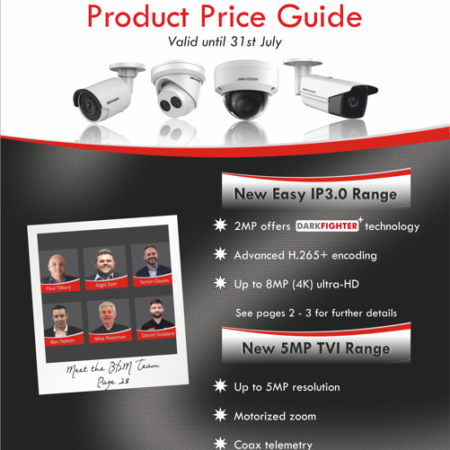 We have also added to our range a number of new PTZ models along with a range of Hikvision monitors, all details are within the price guide along with the contact info of our external business development team who are on hand to arrange a meeting with you if required.